This report details our findings about how well each vendor fulfills our criteria for constructing an online collaboration service and where they stand in relation to each other. 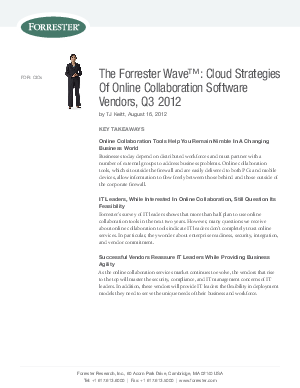 Forrester chose to evaluate the overall strategies of these providers across criteria like global footprint, service-level agreements, mobile support, enterprise readiness, and more. This report and associated Excel model highlight the key criteria CIOs and their staffs should evaluate when looking at prospective providers of online collaboration services.